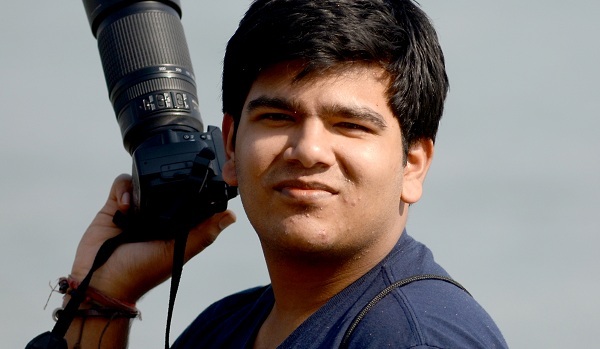 Varun Dutta Gupta shares an adventurous story of interning with World Wildlife Funds (WWF) India, and spending his summer in the forest trapping leopards, hyena and what not in their hidden cameras. Varun is a student at Amity University Noida. Read on to explore about his days in the jungle. My internship with WWF was not like any other regular internship. It wasn’t about sitting inside an AC room and working on a PC, or one near to our own town. It was far-far away from Dehradun. My internship was based on identifying, and then classifying, the real leopards from our fitted camera traps. On the first day of my arrival I had to wait outside the office of my reporting officer for hours and hours. I was tired after a long grueling journey in an uncomfortable bus having being travelled for almost 9 hours, but I was filled with enthusiasm as it was the first time I was interning and I just couldn’t wait to get assigned with first task. I reached the office at around 4 in the evening and had a quick snack enroute, as I thought that I would get to work at the very instant. But I was wrong, very wrong. My internship did not begin even after 2 days from then. I sat there waiting for a junior officer to guide me on anything. He, however, handed me the keys to the office and disappeared saying that one of the senior officers who was presently on the field would be guiding me. From 4 in the evening till 11 at night, I was alone in the office and had no clue what I was supposed to do. Should leave to get food leaving the office open? Or should I lock the office and go? But if the officer came back? What if something gets stolen from the office? And where should I go? Meanwhile my stomach was turning cartwheels due to hunger. And my parents were calling me again and again to know what was happening. I was trying to pacify them, but in my own heart, I was feeling scared.The junior officer came back at 11 PM in the night. When I asked him about the arrangements made for my stay, he told me that I would be staying in the office only. I looked around–three chairs, two tables and an almirah. So that implied that the floor would be my bed. Thank God there was a bathroom! All the rosy pictures about internship turned into black and white reality. Internship was not going to be easy! After spending an uncomfortable night on the floor, I was taken to a room away from the city and was told that I would be working under another person. Since I was familiar with the name as he is till date one of the leading tiger researchers in India, I was very happy. My in-charge called me up and told me that, it being Sunday, no work would be done. All I did that day was sat in my room and watch movies on my laptop. The next day my guide gave me a pen drive and asked me to copy all the photographs in my laptop . The pictures were not ordinary photographs, these were from camera traps set up by my Guide. The photographs had all mammalian creatures from striped hyena to tigers and leopards. I was told that I had to delete all other photographs except the ones with leopards. The files also contained videos taken by camera traps. I saw a photograph wherein in the first shot an elephant was approaching the camera and the next few were of the sky. Apparently the elephant had discovered the camera trap and thrown it in the air. It’s amazing to see these creatures undisturbed by humans. The photographs were an amazing insight into the world of wild animals. After hours of classifying the leopards the way I was instructed to do, I went for a trek in the near by forest. Such an amazing sounds of birds and other creatures, and the sight of trees in their different hues of green! As it was late in the summer, the trees had bloomed and colours were in abundance. The next few days were spend in the same fashion – classifying and identifying.Trust me it is difficult and tedious. After about a week, I got a call from my Guide inquiring about the status of the work. He then asked me to join him for a field trip and stay with him in the forest for some days. I was naturally excited to hear this and packed my bags instantly. Early the next morning, sir came to pick me up. There were a few students who were doing research and some experts in wild life who were also accompanying us. We went inside the jungle and were told that we had to trek; I wish he had told me how much, at that time. It wasn’t 1, 2 or even 3 kms, it was 24 kms! We trekked all day and saw beautiful birds and a few mammals and lots and lots of reptiles from snakes to monitor lizards. I was told that we would be staying in a guard tower and sleeping on the roof under the moonlight. I was delighted to hear this as it had been a long time since I had slept under the open sky and without having to fear being mugged or even stabbed to death. The sky in the wild is not like what one sees in the city. It is like living in the different world. There were thousands and thousands of twinkling stars in the crescent moonlight. The next day, the main problem was struck when I had to do the daily routine. Well there weren’t any washrooms and the guards had scared us by narrating the tale of a charging bull elephant in the vicinity which took it as his special duty to attack any human slouched in the field. But when one has to go one has to go! Irrespective of charging bulls and hungry man eaters! After having a quick breakfast of dry rotis and some vegetables, we were ready for another trek. This trek was easier than the previous day – just 15 kms. That day, I saw something just amazing. In a small cove, there was a full -bellied python. It was hissing at us and we could hear the crushing of bones of the poor, now deceased, animal, most probably a deer looking by the size of its belly. It looked like the belly of a sumo wrestler but it was as if it had been oiled. It looked scaly and slippery. I was having sharp goosebumps, and reminded me of Havells ‘shock laga’ ad. After admiring the creature we left it to enjoy its meal. After four days of long grueling treks, which opened for us amazing sights of the wild, it was time for us to come back to the civilization, or was it that we were going back from the civilization. I had another adventure once I came back. This time it was with the simian species. A bunch of hooligan monkeys were dancing and prancing around my room and as soon as I tried to enter the building they started chasing me. And trust me, a monkey cannot be friendly when it is approaching you. Well, what then! I ran for my life! I had been bitten by them when I was a kid and didn’t particularly relish the idea of any more injections. After spending an hour in the nearby canteen, I went back to my room. Thankfully they had ventured elsewhere. The next few days were the usual – working on my laptop and then when I got tired I would watch a movie or two. After about a week I had to meet my guide to hand over my research material. On my way to meet him, I saw the monkeys staring at me with their mouths open, birds hopping from one tree to another, and a monitor lizard probably having a sun bath. The sights I would take back with me. The work given to me had been completed and then I had the long journey back home. Did I enjoy my internship? Obviously yes. Working in harsh unfamiliar circumstances makes one love ones comforts which were earlier taken for granted. I wanted to do internship with your foundation i have done political science hons from DU ie university of delhi i could not find any link or way to how to apply for the internship with your foundation so please help me with the same.